George IV chair, around 1800. 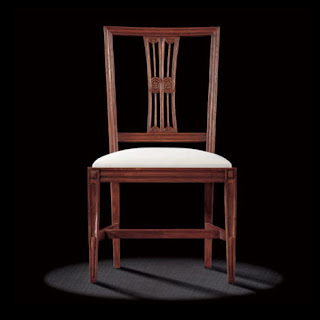 Dimensions of George IV chair : 93,5 H x 51,5 W x 41 D cm. This antique chair is antique reproduction furniture English style formed during the last twenty years of the 18th century. The period designation derives from the Prince Regent, who became George IV in 1820, it is based at the outset on the French classical Directoire style, but the originality of the English neoclassical style is intense. The simplicity of this model arising from the canons of classicism is emphasised by its cross-piece and the cut of its back. The design of the whole and the discreet sculptures make it a very topical seat. We can also recognise in it the simplicity arising from the aesthetic influences that dominated Northern Europe for a century (England, Holland, the Scandinavian countries…).